Specter (スペクター, Supekutā?) is an albino monkey and the main antagonist of the series who wants to rule the world. the most powerful villain in ape escape also. In the first Ape Escape game it was said that he was the main attraction at Monkey Park and he was the first monkey to put on a Peak Point Helmet though, unlike the other monkeys wearing one, it gave him special pyschic powers, made him able to speak human language and become extremely intelligent as well as evil. He tries to rule the world by using the Professor's time machine to send his monkey minions back in time in order to change history by having monkeys be the dominant species. He kidnaps and mind controls Jake though his plan is foiled by Spike who defeats and captures him, sending him back to Monkey Park where he becomes a regular monkey again. In the second game he finds another helmet after Jimmy accidentally sends some to Monkey Park. He then sends his monkey minions to different parts of the world and puts together The Freaky Monkey Five to stop Jimmy. Meanwhile, Specter works on building a weapon called the Lethargy Laser that will make all humans on Earth unwilling to fight against him. However he is again defeated and captured. He escapes, but is later recaptured. In the third game he works alongside Doctor Tomoki and tries to take over the world by using TV to turn all humans that watch it into a mindless couch potato. However Natalie is unaffected and she gets help. His partnership with Tomoki ends after he makes fun of Tomoki though he doesn't care as he can take care of the rest of his plan by himself. Later it is revealed to use a giant robot hand to split Earth in half, letting the monkeys rule one side and the humans fight over the other side. His plan is foiled by Kei and Yumi though he, along with the other four members of The Freaky Monkey Five, get rescued by Pink Monkey who was not captured. However he and The Freaky Monkey Five (including Pink) are soon recaptured by Kei and Yumi. He appears in Ape Escape: Pumped & Primed where he has again kidnapped and taken control of Jake's mind. 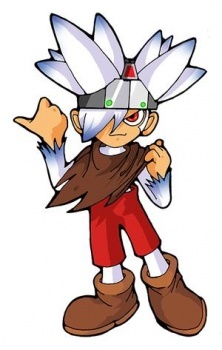 He also appears in Ape Escape Million Monkeys and Ape Escape: SaruSaru Big Mission. Despite having minons do his dirty work for him, he is not a coward and will fight against the main character/characters of the game if he has to. He always fights using various forms of pyschic attacks. Despite his general hatred of humans, he does occasionally ponder about his owner. A recurring element of each game is that to fight Specter the player always to capture every monkey in every level before the final showdown with Specter. Also, in his first fight with the hero, he typically uses a large monkey themed robot suit, and fights using his own powers and his mechanical throne in the second fight. In the anime, he was a monkey named Kuuta (クータ?) who was owned by Natalie before he was transformed into Specter by the Pipotrons. He is generally seen sitting on a levitating throne, wearing a red cape, although in some games, he has taken to wearing a formal suit and bowtie.